I know I haven't been around much lately. Sorry. I've been focused on getting the family back into a routine with back to school (and activities) and doing a lot of self care. Yoga, yoga and more yoga. Dry brushing. Steam room. Massages. Chiropractor. Supplements. Adrenal pills. Magnesium oil. Clean food. Ya-da, ya-da, ya-da. Its all very time consuming. But its working. After a VERY rocky monthly cycle (beginning of September) when I had been trying to go off my adrenal support, I think I have things back in balance. Thank goodness. I was really not a fan of Crazy/Grumpy/Moody/BrainFog MamaChanty. This month was MUCH better, not perfect, but better. In the meantime, I continue to have to feed my family and satisfy my never ending hunger. 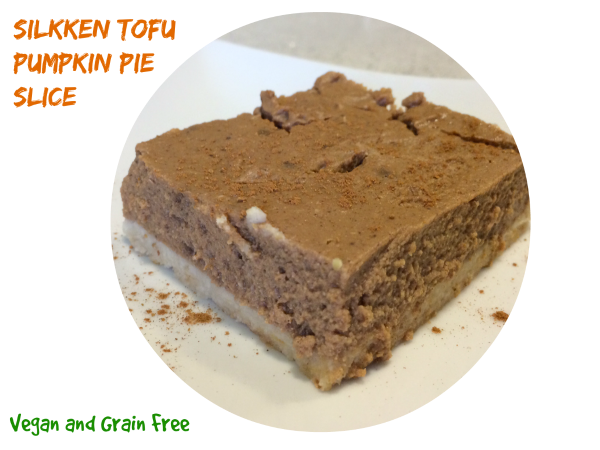 So I have been doing some baking and continue to experiment with Silkken tofu. I love this stuff - low calorie, high protein, creamy, non-dairy. What's not to love. Yeah - I know all about the phytoestrogens and negativity surrounding soy. I don't go crazy on the stuff and I always stick with non-GMO/organic so I think its okay in moderation. Anyway - with Fall here and those gigantic pumpkin pies tempting me at Costco I thought I better come up with a pumpkin pie alternative for Thanksgiving. And every weekend. And sometimes for breakfast. Its high protein. Its okay. This recipe is super easy. And guess what. Costco is now carrying Silkken tofu at a crazy cheap price. So no excuses...........try it. You will be pleasantly surprised. Mix together all dry ingredients. Add coconut oil and almond milk and combine until crumbly. Press into a 8 inch glass pie pan or 8" square baking dish. Bake in oven for 6 minutes. In the meantime, put all the filling ingredients in a high powered blender (or food processor). Pulse/blend until fully combined. Bake for 25 minutes at 425. Reduce heat to 350 degrees and bake for another 30 - 35 minutes. Remove from oven and let cool to room temperature before putting in fridge to chill before serving. Serve with whipped coconut milk.